Ethan first visited East Surrey College as part of a Taster day with his former school, de Stafford. He then spent a summer helping out with landscaping work, and spent one week gaining plumbing experience. This sparked a desire to pursue a plumbing career, and he enrolled on the Plumbing Level 2 course, choosing to undertake an Apprenticeship with local business Midas G20. In February 2019, Ethan's tutor, Sarah, entered him into the HIP UK Heating Apprentice of the Year competition. He took part in the South East Regional heats, competing against seven other Plumbing Apprentices in a range of challenges including piping up a boiler, shower and radiator. 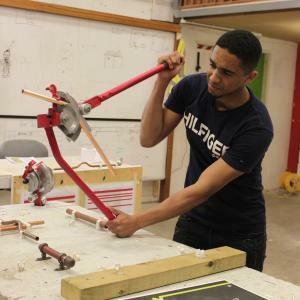 Explore our Construction courses, including Plumbing.